This report provides practical, timely information on methodsand equipment used in placer gold recovery. Included is detailed information on equipment, practices, recovery factors, efficiency, design, and, where available, costs. Selected gold recovery operations are described in detail. In addition, the reported efficiency and reliability of various types of equipment used today is presented. One notable method not described is the cyanide process, the recovery of gold through leaching with cyanide, a hazardous substance that must be handled with great care. The information presented herein applies to small as well as large placer mining operations. Recreational and independent miners will find information on available equipment and designs with some suggestions for improving recovery. Those intending to mine small to medium-sized placer deposits will find detailed descriptions of suitable equipment and recovery methods. 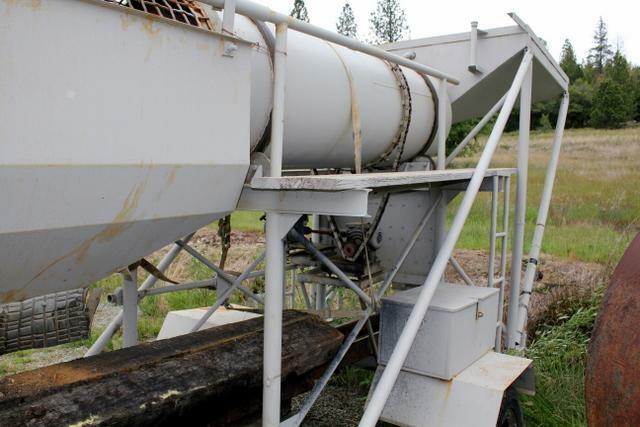 Finally, those interested in byproduct gold recovery from sand and gravel operations and other large placer deposits will find descriptions of appropriate equipment and byproduct recovery installations. There is also a list of manufacturers and suppliers for much of the described equipment. Gold has been mined from placer gold deposits up and down the state and in different types of environment. 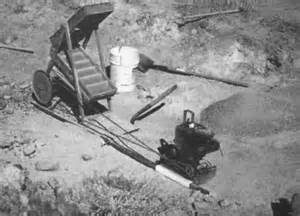 Initially, rich, easily discovered, surface and river placers were mined until about 1864. Hydraulic mines, using powerful water cannons to wash whole hillsides, were the chief sources of gold for the next 20 years. In 1884, Judge Lorenzo Sawyer issued a decree prohibiting the dumping of hydraulic mining debris into the Sacramento River, effectively eliminating large-scale hydraulic operations. For the next 14 years, drift mining placer gold deposits in buried Tertiary channels partially made up for the loss of placer gold production, but overall production declined. Production rose again with the advent of large-scale dredging. The reason so much of it has been mined from placers is that placer deposits are usually easier to locate than lode deposits. A lone prospector with a gold pan can verify the existence of a placer gold deposit in a short period of time. Small placers are also relatively easy to mine, and the ore usually requires less processing than ore from lode mines. The same holds true for large placers other than drift mines. Today, placer gold production comes from the dredge operating at Guatemala, from large placer mines employing the cyanide process, from byproduct recovery in sand and gravel plants, from small placer mines, and from small dredging operations in rivers and streams. With placer mining, recovery of the gold from the ore is usually the most expensive phase of the mining operation and can be the most difficult to implement properly. The value of gold deposits is based on the amount of gold that can be recovered by existing technology. Failure to recover a high percentage of the gold contained in the deposit can affect the value of the deposit. Gravity separation remains the most widely used recovery method. Gravity recovery equipment, including gold pans, sluice boxes, dredges, highbankers, long toms, jigs, and amalgamation devices, has been used since old times, and many present day operations still employ the same equipment. The major flaw of the gravity separation method is that very fine gold, referred to as flour, flood, or colloidal gold, is lost in processing. Early miners recovered no more than 60% of assayed gold values, and as late as 1945 recovery of free gold averaged only 70-75% (Spiller, 1983). Moreover, it is likely that most remaining placer deposits have a higher percentage of fine gold than placers worked during the gold rush. It i understandable, then, that today more care is given to the recovery of fine gold. 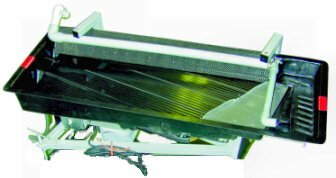 In recent times a number of changes and new designs in gravity separation equipment have been developed. Most of these were developed outside the United States for the recovery of materials other than gold. Some of the new equipment has been successfully used to recover gold and some older designs have been modified and improved. Today, many types of equipment exist for the efficient recovery of placer gold. It is important to note that recovery techniques are often very site specific. A recovery system that collects a high percentage of fine gold from one deposit may not perform effectively with ore from a different deposit. Many factors, such as particle size, clay content, gold size distribution, mining methods, and character of wash water, affect the amount of gold recovered. Extensive experimentation and testing is usually required to design an optimum gold recovery system. The recovery of placer gold involves processing similar to the processing of most ores. First, the valuable material is separated from the valueless waste through concentration. The final concentrate, usually obtained by repeated processing, is smelted or otherwise refined into the final product. This report focuses on the equipment and methods used for initial processing, or concentration. As in other processing applications, many specialized terms are used to describe the phases of mineral concentration. Although these terms are described herein as they relate to the processing of placer gold ores, most of the terms identified apply to mineral processing in general. The concentration of placer gold ore consists of a combination of the following three stages: roughing, cleaning, and scavenging. The object of concentration is to separate the raw ore into two products. Ideally, in placer gold recovery, all the gold will be in the concentrate, while all other material will be in the tailings. Unfortunately, such separations are never perfect, and in practice some waste material is included in the concentrates and some gold remains in the tailings. Middlings, particles that belong in either the concentrate or the tailings, are also produced, further complicating the situation. Roughing is the upgrading of the ore (referred to as feed in the concentration process) to produce either a low-grade, preliminary concentrate, or to reject tailings that contain no valuable material at an early stage. The equipment used in this application are referred to as roughers. Roughers may produce a large amount of concentrate, permit the recovery of a very high percentage of feed gold, produce clean tailings, or produce a combination of the above. Roughers include jigs, Reichert cones, sluices, and dry washers. The next stage of mineral processing is referred to as cleaning. Cleaning is the re-treatment of the rough concentrate to remove impurities. This process may be as simple as washing black sands in a gold pan. Mineral concentrates may go through several stages of cleaning before a final concentrate is produced. Equipment used for cleaning is often the same as that used for roughing. 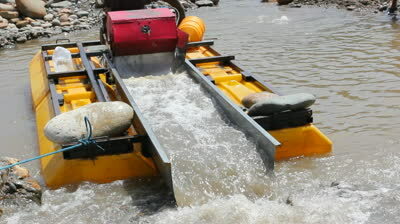 A sluice used for cleaning black sand concentrates is one example of a rougher used as a cleaner. Other devices, such as shaking tables are unsuitable for use as roughers and are used specifically for cleaning. Concentrates are cleaned until the desired grade (ore concentration) is obtained. depending on the amount of tailings to be processed. Any piece of equipment used in this latter capacity is termed a scavenger. Specific terms are also used to describe the efficiency of the concentration process. 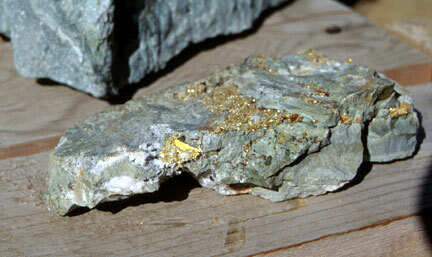 Recovery refers to the percentage of gold in the ore that was collected in the concentrate. A recovery of 90% means that 90% of the gold originally in the ore is in the concentrate and the remaining 10% is in the tailings and/ or middlings. The concentrate grade is the percentage of gold in the concentrate. A concentrate grade of 10% indicates the concentrate contains 10% gold by weight. The ratio of concentration (or concentration ratio) is the ratio of the weight of the feed to the weight of the concentrates. For example, if 1,000 pounds of feed are processed and 1 pound of concentrate is recovered, the ration of concentration would be 1,000. The value of the ratio of concentration will generally increase with the concentrate grade. There is a general inverse relationship between recovery and concentrate grade in mineral concentration. Usually, the higher the concentrate grade, the lower the total recovery. Some valuable material is lost in producing a high grade concentrate. In such cases, the higher grade concentrate is easier to refine than a lower grade concentrate, reducing refinery costs. The savings in refining costs is usually greater than the cost of recovering the small amount of remaining gold from the tailings. For each mining operation, a carefully determined combination of grade and recovery must be achieved to yield maximum profitability. 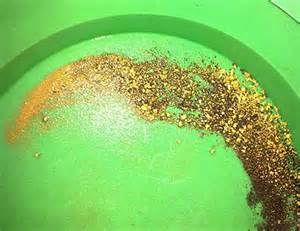 The best recovery systems will collect a maximum amount of placer gold in a minimum amount of concentrate.